According to the manual the cd changer is a box in the back of the Jeep in the cargo area, there isn't one back there, it's supposed to be on the side panel but I couldn't find one. Also there is no button to advance to another track. I'm going out to the Jeep dealership this next month and see if they can tell me anything about this unit while I have a few other questions for them about my Jeep. I figured Audacity would just make the play list. I already have CDburnerXP on my computer for burning data cds. And I had to look. It's your fault foxy, you made me curious enough, cat lovers ( I am one) click here. Now I'm distracted by tiny kittens. I sent that link to my daughter and granddaughter too. I'm a cat person too. Foxy was my beloved gray longhair, and I loved her, but shoot me first before I adopt another longhair. I had some problem with wax in one ear about 10 years ago, and there was also gray fuzz in the plug my doctor removed. Fuzz in the keyboards, fuzz in the carpets.... And she hated to be brushed. This will be the only animal I'm allowed to own. In 6 weeks time when they're old enough to leave mom, I'll have two, Grumpy you see below and his sister, Angel. Is that a type of badger? Anthony is my 7th. You can't have dogs in this building, but cats are allowed. You can't have animals because of your brothers or the building management? Last edited by foxy; March 8th, 2019 at 09:08 PM. Yes, they are! cute to play with too. They're love to cuddle too. They like to crawl all over you. The sugar glider is a small, omnivorous, arboreal, and nocturnal gliding possum belonging to the marsupial infraclass. But don't confuse them with our opossums. These little guys only get up to 4.3 oz at adult stage. And Grumpy above is a baby at 3 weeks old. As for why I can't have other animals, it's a brothers thing. We all live in the house my mom and dad had built in 1960 with sits on a two city lots in an urban city type setting. not really city but not country either, but close to an inter-coastal waterway. Both parents have passed and we siblings, 11 of us, inherited the house. It's a single family dwelling with three bedrooms, each of us, two boys and me, has a bedroom. They are my older brothers by one being 6 years older and one being 4 years older. And both think they can tell me what I can and can't have. 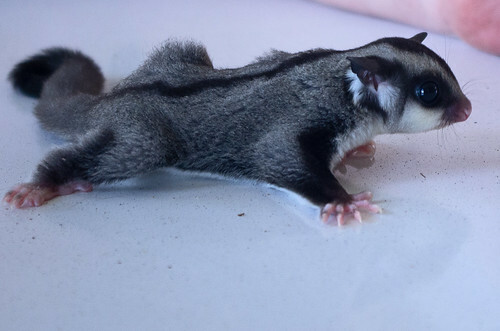 So to compromise I've decided the sugar gliders won't be roaming the house, won't stink up the house and they'll be in a cage most of the time, except when I take them out and put them in their pouch, or have them on my body, they can compromise and let me have them. I had cats when I lived in Minnesota, Little Face, and Patchie boy. But when I left there, I had no way to take them with me, so I had to find them homes before I left. I have photos of them though and I'll see if I can dig them up. Oh, and I had one cat while in Texas too, her name was Sweets. I couldn't bring her to Florida either so I left her with my daughter Terri. Who didn't take care of her and she passed away not long after I left Texas. I was not happy about that either. Adorable, like a kitten. And we could surf all over the net now, but I have opera tickets. Is the Jeep music issue resolved? I just read that you can plug a changer into some of them, but I wouldn't have the space. My car is like a little box on wheels. No music for the Jeep is not resolved. I haven't had a chance to get out to the Jeep dealership to see if they have an answer either. The forum I joined didn't seem to know the answer either and it was supposed to be a JeepGarage. Actually, they didn't seem to know much about any Jeeps.